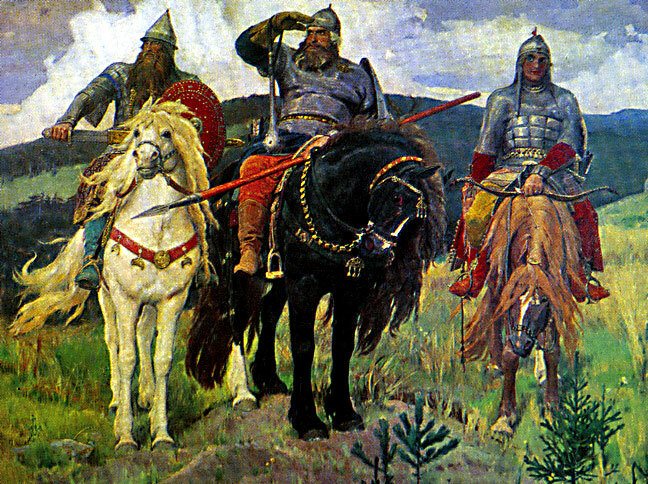 This famous painting by Vasnetsov of Rus "bogatyrs" well depicts the early rulers of Kyiv and other towns. They were all warriors. Here we see the legendary heros, left to right, Dobrynya Nikitich, Ilya Muromets, and Alyosh Popovich. The chart below depicts the first seven generations of rulers of Rus descended from the semi-legendary Rurik. (Or six generations from the historical Igor. Some historians have pointed out the questionable matter of the time spread between the appearance of Rurik and the known dates of Igor and calculated that there should be possibly two generations between them). Skipping that issue, we have the period from about 860 AD to the death of Yuri I Vladimirovich in 1157. The history of fratricidal conflict in this family began early, when Vladimir I brought a Varangian (Viking) army south from Novgorod to unseat Yaropolk I from the throne at Kyiv. It is evident that, since Yaropolk I and Oleg Svyatoslavich died without heirs all subsequent princes in Rus were descendents of Vladimir I Svyatoslavich. He sent his eldest son, Izyaslav, with the latter's mother, Ingegerd, to live in Polotsk when he married the Byzantine princess, Anna. Thus the line of princes who governed Polotsk is the only family not descended from Yaroslav I Vladimirovich (the wise). This line is shown in the diagram from Izyaslav Vladimirovich. Amongst Izyaslav's half brothers, Svyatopolk I seized the throne on the death of their father, Vladimir I, and swiftly had his half brothers, Boris, Gleb and Svyatoslav, murdered. Mstislav escaped this by being the ruler in far southern Tmutorokan and Yaroslav escaped by being in far northern Novgorod. Yaroslav then followed his father's example and brought a Varangian-Novgorodian army south and routed Svyatoslav I and his Polish and Pecheneg allies. After Yaroslav I was on the throne at Kyiv, Mstislav brought an army north to dispute him. Mstislav won the battle, but there was a subsequent compromise agreement by which Mistslav governed the left bank Rus from Chernigiv and Yaroslav governed the right bank Rus from Kyiv. (But Yaroslav prudently remained for the most part at Novgorod. The remaining half-brother, Sudislav, was imprisoned. When Mstislav Vladimirovich died without heirs (having been predeceased by his only son), all Rus (except nominally Polotsk) was reunited under Yaroslav's control. In the next generation, however, division commenced. Vladimir, Izyaslav I, Svyatoslav II, and Igor Yaroslavich all founded princely houses that continued to rule individual sections of Rus lands with more or less autonomy depending on circumstances and the relative proliferation of their descendents. Their family trees are shown in the diagrams below their names. Here is the chart showing the relationship between the various geneology diagrams. The main line of Rus princes continued through Yaroslav I Vladimirovich's grandson, Vladimir II Vsyevolodovich Monomach. Two more major divisions then occured when two sons of Vladimir II, Mstislav I and Yuri I, established separate princely houses in Galicia and Rostov-Suzdal respectively. These may be followed in the diagrams under their names. But in subsequent generations these and the line of Chernigiv princes begun by Svyatoslav II all divided into still more separate lines. All these are shown in subsequent diagrams linked to their parents. To read short descriptions of the individual princes please place your cursor over a name and see if a link to the individual is provided. All the individual princes are linked also both to their fathers and their sons. Thus one may follow the entire Rurikid family tree either by moving from father to son through the individual biographies or by following the chain of geneological diagrams. There is also a separate chart showing only those princes who managed to claim the throne at Kyiv, no matter how briefly. There is a separate geneological chart for the Romanov family. There is also a file that provides a direct listing of all the rulers from Rurik to Nicholas II in sequence irrespective of their family ties at rusruler. The individual descriptions provide a convenient place in which to add more information on the ruler or reign as it is obtained. Already some are much more extensive than others. An alphabetical index to all the princes is being developed. And there is a chronology of events from pre-historical times to about 1800. The geneological information is taken from V. M. Kogan's detailed identifications in Istoriya doma Rurikovichei, St Petersburg, 1993 and N. de Baumgarten's works Genealogies des branches regnantes de Rurikides du XIII au XVI siecle, Orientalia Christiana vol XXXV-1 number 94 June 1943, Pontifical Institutum Orientalium Studiorum, Roma, and Genealogies et mariages occidentaux des Rurikides russes, Orientalia Christiana vol IX - 35 Pontifical Institutum Orientalium Studiorum, Roma. and N. M. Karamzin, Istoriya Gosudarstva Rossiiskogo, Kniga Chetvertaya, Kluch, Rodoslavoniya Tablitsi knyazei Rossiiskikh', St Petersburg, 1844, reprinted Moscow 1988.